Here is a collection of unique golf facts to amaze your game-playing friends at your next outing, probably tomorrow. Evidence tells of a game of golf being played in China in 957. The game consisted of hitting a ball into a target placed several hundred yards away. The ball was hit with clubs. In 1457, the game of golf was banned in Scotland by King James II when he issued the 1457 Act of the Scottish Parliament. This is the first written record of the game of golf. He banned the game of golf because he wanted young men to be outstanding at archery. The ban remains in effect until 1502. The word golf probably derives from the Scottish verb to gowff which can be loosely translated to mean to strike hard. Golf trivia facts reveal that 1452 saw the sale of the first golf ball. These golf balls were usually made of beech or boxroot wood. 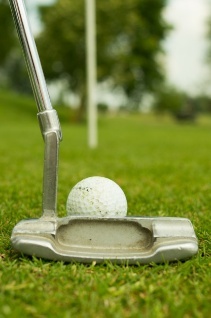 1502 saw the first recorded purchase of golf equipment. King James IV brought a set of clubs, made from wood. The clubs were made by an archery maker in Perth, Scotland. Not for another hundred years, in 1602, is there any reference of golf clubs being manufactured for a particular player. That player was King James VI who reinstated the playing of golf after the signing of the Treaty of Perpetual Peace. 1618 saw the creation of the Featherie golf ball. These balls were made by stuffing wet feathers into a leather sphere and then the sphere was sewn shut. Next, these balls were painted. The balls were very expensive so the common people could not afford them. Most golf balls were made by Andrew Dickson, Leith and Henry Mills and St. Andrews. Golf trivia facts note that the first mention of golf in America was in 1659 when golf was banned from the streets of Albany, New York. At that time, Albany was the tenth largest city in what was to become America. The oldest golf course is Musselburgh Links located in East Lothian, Scotland. From this course, golf gets its 4 ½ inch hole. Golfers can still play this course. The course only has 9 holes. The course is a par 34. 1682 saw the first golf caddy. Andrew Dickson carried the golf clubs of the Duke of York. In 1848, Reverend Adam Paterson introduced a new golf ball. This new ball, known as the Gutta Percha ball, was made of sap from the Gutta tree. Golf Trivia Facts reports that the first golf tournament was held on October 17, 1860 at the Prestwick Golf Club in Prestwick, South Ayrshire, Scotland. The tournament consisted of 3 trips across the course’s twelve holes, although 4 of the greens were played twice. The winner of the tournament was Willie Park Senior. The original Open had only eight players all of whom were considered professionals. For winning, Mr. Park received a red leather belt with a silver buckle. The first national set of rules for golf was published by the Royal and Ancient Golf Club in 1897. You are now prepared to set off to the greens and amaze your friends at tee-time. Tennis was played as an official Olympic sport in the year 1896. Later in 1924, due to some controversies, it was removed from the Olympic Games listing but was again added in 1988.